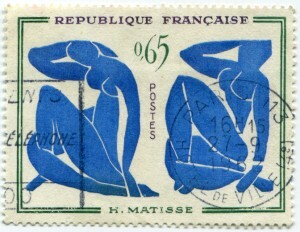 Bringing in a New Year with a Birthday: Matisse! What better way to bring in the new year than with a birthday? As it turns out, one of the most revolutionary French artists of the 20th century, Henri Matisse, was born on December 31st, 1869 in northern France. Although he died in 1954, it’s definitely still a birthday worth celebrating. Keep that in mind tonight when sharing champagne (or sparkling grape juice, which is just as exquisite) with friends and family as you bring in 2016! Originally inspired by famous artists such as Vincent van Gogh and Georges Seurat, Fauvism was an artistic movement which flourished by the inspiring work created by the Fauves group. Matisse became the leader of the Fauves, but it also included such artists as Albert Marquet and Georges Rouault. Fauvism in art is defined by a focus on individual expression and color as its own element. The idea was color could develop theme and mood without being bound by its natural use. A Fauvist piece would also include the experiences, responses, and perceptions of the artist. The artwork of Matisse includes many famous pieces created throughout his lifetime and was commissioned by many influential collectors. Some of his best-known works include Open Window and Woman with a Hat (1905), Dance I and Music (1909-1910), Piano Lesson (1916), and The Red Studio (1911). In fact, you can see several of Matisse’s paintings and works right here at the Baltimore Museum of Art. Of course, it’s not quite the same as an exciting trip to France and the many Paris museums with his most famous works. You can see France in person, just leave it to the pros. AESU offers several trips to France, including Cosmopolitan, Explorer, Euro Focus, Great Escape, and Euro Spree. Explore France and see the famous Eiffel Tower, plus check out the amazing gourmet food and incredible art museums. If you have any questions or want help booking your France adventure, please contact AESU by calling 800-638-7640, or fill out the contact form found on our website. This entry was posted on Thursday, December 31st, 2015	at 4:00 pm	. You can follow any responses to this entry through the RSS 2.0	feed. Both comments and pings are currently closed.